My mother and I went to see the opera Dialogue of the Carmelites not so much for entertainment but because the story was about persecuted Catholics. For those of you who homeschooled your children using Seton, The Song of the Scaffold by Gertrude von la Fort should be familiar to you. Dialogues is actually based on this novella. The entire opera played out in three acts was a very spiritual experience. 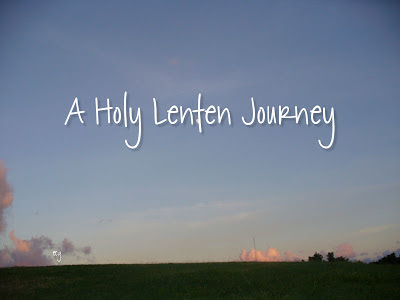 It was very appropriate not only for the Lenten season but because of the anti-clerical times we are beginning to experience in our own world. None of the music or arias was familiar to me. 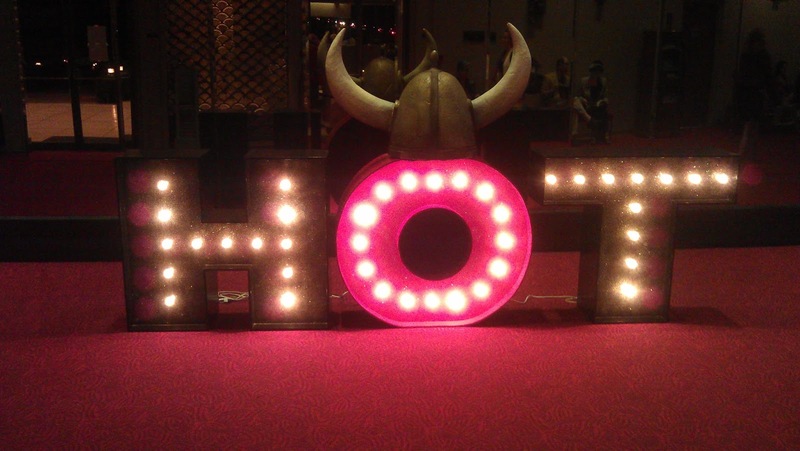 Usually, this would have made going to the opera very difficult for me to enjoy but that was not the case here. I noticed that after the first act, a few people left. One lady commented that she really was not enjoying it. I thought it sad because they did not give the story a chance to develop to the climatic moment (spoiler alert) when the sixteen Carmelite nuns go to Madame Guillotine, singing the Salve Regina. I wondered if the open Catholic spirituality that enveloped this story turned those people off. I hope not. I was hoping and praying that the opera-goers would be touched by the spirituality in a place of worldly entertainment. I did notice many Catholics in the audience. In fact, we sat in front of two sisters of the order of Saint Marianne Cope. The sisters really enjoyed the opera/story. They also showed much interest in reading the book. 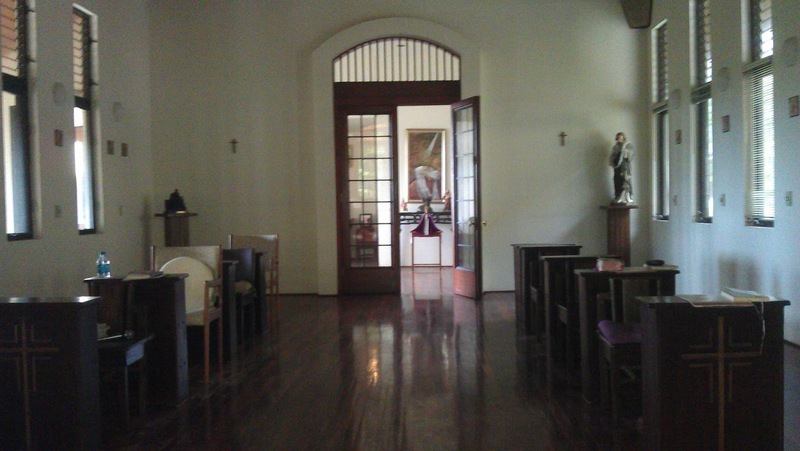 This morning my mom and I had an opportunity to attend Mass at the Carmelite monastery. 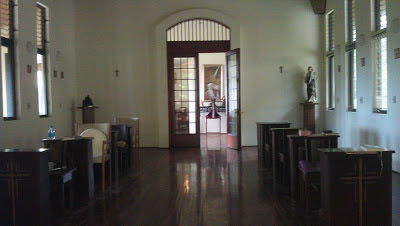 It was like being back in the days of Santa Teresa de Avila. Right before Mass begins, the grille opens up and we can get a peek of the nuns. Afterwards, we were able to meet and greet these friendly nuns. In the photo I took, you can see the Infant of Prague way in the back. In a scene in the opera, the very frightened nun was given an Infant of Prague to console her and give her strength as the enemies of the Church become more of a threat. She is startled and the statue falls to the ground and breaks. She cries out "The Little King is dead! And we have nothing left but...the Lamb of God.!" Irondale, AL – Deacon Bill Steltemeier, 83, who was known to millions of television viewers around the world as the longtime associate of EWTN Foundress Mother Angelica, died peacefully early this morning, Feb. 15, at his home in Hanceville, Alabama following a lengthy illness. Philadelphia Archbishop Charles J. Chaput, O.F.M. Cap., the longest-serving member of EWTN’s Board of Governors, knew Deacon Bill well. "Mother Angelica's vision and dedication inspired the founding of Eternal Word Television Network, but the man who more than anyone turned her vision into practical reality was Deacon Bill Steltemeier. As Mother's coworker, right hand and friend for many years, Bill lived out a tremendous commitment to bringing the Gospel of Jesus Christ to the world through the modern media. He was an extraordinary man, and millions of EWTN viewers will remember him with gratitude and respect. May God console his family and grant him eternal light and joy." Born in 1929 in Nashville, Tenn., to the late Rudolph William Steltemeier, Sr., and Mary Ione (Phippen) Steltemeier, R. William Steltemeier, Jr., attended Chaminade College Preparatory School in St. Louis, Mo., and Vanderbilt University. He married Ramona Schnupp on Aug. 22, 1953. A year later, after graduating from Vanderbilt Law School, Bill entered the United States Army and served for two years in France. In 1960, he co-founded the Nashville law firm of Steltemeier & Westbrook specializing in bankruptcy and commercial law. After fifty years, the firm is still serving clients in middle-Tennessee with expanded areas of practice. 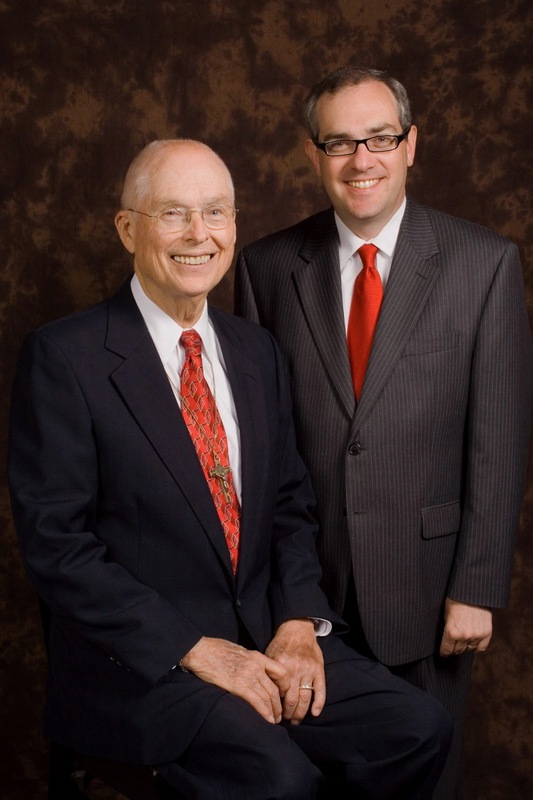 Both as a lawyer and as a committed Catholic, Bill served his community in many ways. For more than three decades, he was engaged in assisting prisoners in both their civil and spiritual rehabilitation. He co-founded a prison Junior Chamber of Commerce program, and served on the boards of the 7-Step Foundation, Operation Comeback, and the Dismas House, organizations dedicated to helping former prisoners transform their lives. In 1975, he was appointed by the Governor of Tennessee to the state's review board for prison reform. Of greatest significance, however, was his ordination on April 26, 1975, as a permanent deacon for the Diocese of Nashville by Bishop Joseph A. Durick. Deacon Bill was among the first men in the United States to be ordained to the permanent diaconate. Following his ordination, he was appointed Catholic Chaplain to the Tennessee State Prison for Men. On March 9, 1978, while attending a legal convention in Chicago, Deacon Bill first encountered Mother Mary Angelica. While Mother Angelica was speaking, Deacon Bill heard an interior voice say to him, “Until the day you die.” He knew from that moment that his life would be devoted to serving Mother Angelica. When EWTN was formed in 1980, Deacon Bill became the Network’s first President and a founding board member. In 1985, he resigned from his law firm to dedicate himself full-time to Mother Angelica and EWTN. For 22 years, Bill would commute each week from his home in Nashville to the Network’s headquarters in Irondale. Upon Mother Angelica’s retirement from active leadership of EWTN in March of 2000, Deacon Bill took over the offices of Chairman of the Board and Chief Executive Officer. Though he retired from the role of chief executive in 2009, he continued to serve as Chairman of the Network’s Board of Governors until his death. In May 2008, the degree of Doctor of Laws, Honoris Causa, was conferred upon Deacon Bill by Ave Maria University in recognition of his accomplishments and service to the Catholic Church. In October 2009, Deacon Bill was awarded the Pontifical Medal Pro Ecclesia et Pontifice by His Holiness Pope Benedict XVI in recognition of his lifetime of extraordinary service to the Church. Deacon Bill Steltemeier is survived by his wife of 59 years, Ramona, who lives in Hanceville, Alabama, where they moved in 2002, and his brother Fred Steltemeier of Nashville, several nieces and their families. He was preceded in death by his son, Rudy Steltemeier, III and daughter-in-law, Debra Steltemeier. Vespers and the Divine Mercy Chaplet will be prayed on Monday, Feb. 18 at 4:30 p.m. CT at the Shrine of the Most Blessed Sacrament in Hanceville, Ala. followed by public visitation. A Prayer Vigil and Rosary will be prayed at 7:00 p.m. CT. The funeral Mass will be celebrated at 9 a.m. CT Tuesday, Feb. 19 at the Shrine of the Most Blessed Sacrament in Hanceville, Ala. Burial will take place at 2:30 p.m. CT Tuesday, Feb. 19 at Calvary Cemetery in Nashville. Please see EWTN’s website (www.ewtn.com) for information about Masses and programs celebrating Deacon Bill’s life. Services may be watched or listened to live on EWTN television by cable or satellite (www.ewtn.com/channelfinder), streaming audio or video on the Internet (http://origin.ewtn.com/audiovideo/index.asp), EWTN mobile (http://www.ewtn.com/mobi/), on theEWTN Radio Network via affiliates (http://www.ewtn.com/radio/amfm.htm), shortwave (http://www.ewtn.com/radio/freq.htm), or on satellite radio (http://www.sirius.com/ewtn). EWTN Global Catholic Network, in its 32th year, is available in over 225 million television households in more than 140 countries and territories. With its direct broadcast satellite television and radio services, AM & FM radio networks, worldwide short-wave radio station, Internet website www.ewtn.com, electronic and print news services, and publishing arm, EWTN is the largest religious media network in the world. Irondale, AL – EWTN will air a tribute to Deacon Bill Steltemeier’s life at 1 p.m. ET, today, Feb. 15. The show will re-air at 8 p.m. ET, tonight. Please join us in celebrating the life of EWTN’s Founding President and Long-Time Chairman of the Board – and our friend. May his soul, and all the souls of the faithful departed, through the mercy of God, rest in peace. EWTN invites you to join us in celebrating the life of Deacon Bill. We will air the Vigil and Rosary at 8 p.m. ET, Monday, Feb. 18, live from the Shrine of the Most Blessed Sacrament in Hanceville, Ala. The funeral Mass will air live at 10 a.m. ET, Tuesday, Feb. 19, from the Shrine, with an encore at 6 p.m. ET and midnight ET. We thank you for your prayers. It was with great sadness that I learned of Deacon Bill's passing. Whenever I thought of EWTN, the Eternal Word Television Network, two people always came to mind...Mother Angelica and Deacon Bill Steltemeier. God has called him home. I know ask that you pray for the repose of his soul. It appears that I recreate old recipes. This is one I did re-do recently. I usually waited to use up leftover white rice and I would either use canned tuna or ground beef to stuff the peppers. I actually cooked up the filling this time using uncooked rice and bulgur wheat. I also used canned Wild Sockeyed Salmon. My veggie-intolerant son really enjoyed this dish, so much so, he ate the leftovers. NOTE: One of the changes I have been making in order to eating healthier is to replace organic products such as canned tomatoes, rice, etc. We are also eating more whole grains such as the organic brown rice and Bulgar wheat. Feel free to continue using your regular brand of canned tomato sauce and salmon for this recipe. Heat small saucepan, add olive oil, onions and garlic. When onions are translucent, add the tomato sauce and herbs. Season to taste. NOTE: canned tomatoes have a high amount of sodium. Be careful not to over salt the sauce. Simmer until the tomato sauce changes color and is bubbling. Choose 3 large fresh green peppers, cut in half horizontally and remove seeds and hard center part. Be sure not to break the pepper cups. Drop in boiling water for about 1 or 2 minutes and drain. Heat a cast iron skillet (or your favorite skillet), add oil, garlic and onions. Fry until onions are translucent. Then add the rice and Bulgar wheat. Fry for 2 to 3 minutes. Add the tomatoes and boiling water. Add the bouillon. Bring to a boil and cover. Heat should now be low. Simmer until the liquid is absorbed. Turn off heat and then add the salmon. Blend throughout the rice mixture. Place the drained green pepper caps in a Pyrex baking dish. Fill the caps with the filling. 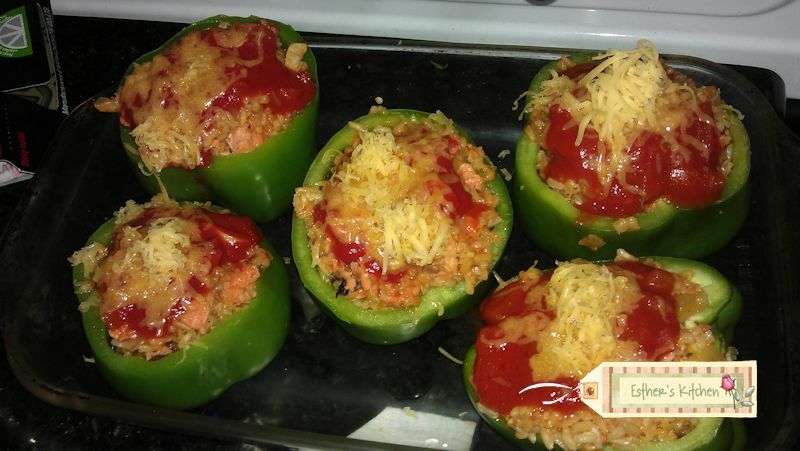 Top with a tablespoon of sauce and shredded cheese. Pour the remaining sauce around the stuffed peppers. Cover with foil and bake for approximately 1/2 hour or until heated thoroughly. Serves 3 to 6 persons. Tomorrow we begin another journey towards holiness if we allow ourselves this privilege. 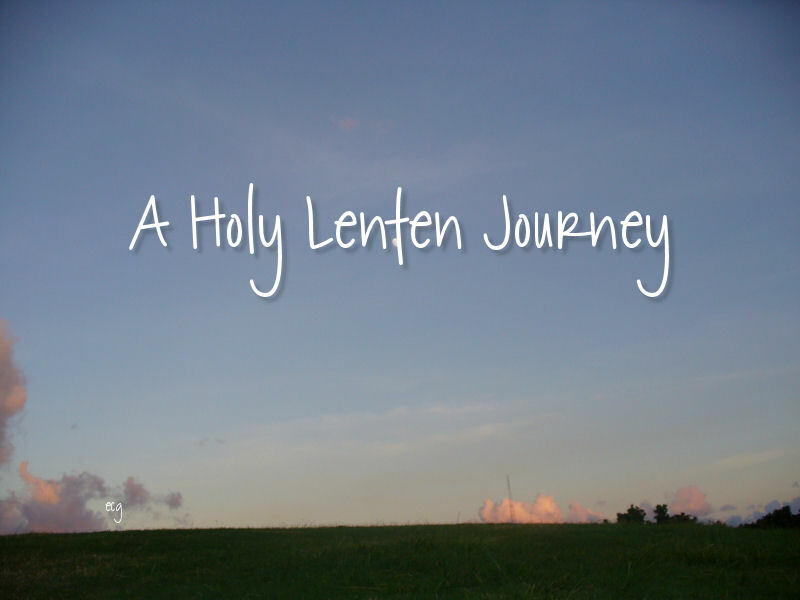 Our journey during Lent should be one filled with much hope and joy. It would be a very sad thing if we see this time in a negative light. We will also be cheating ourselves if we simply resolve to give up one thing for Lent. As children we were taught to give up candy or give up television during the Lenten season. But how many of us were truly taught the reasons why? "...When I was a child, I used to talk as a child, think as a child, reason as a child; when I became a man, I put aside childish things.." St. Paul's Letter to the Corinthians 13-8. The sacrifices we make for Lent must come from the heart. Lent is a time of cleansing or purification of heart, mind and soul. We will filled with numerous graces from God and we will grow closer to Him if we deny ourselves more than we usually do during these forty days.. We will accompany our Blessed Lord, recalling His Passion and ultimate sacrifice when He offered up His sinless life for our very sinful ones. He will not be alone during His agony in the garden because we will be there by His side, offering up more and more sacrifices that will ease His sufferings. The following are suggestions to help make our Lenten journey more efficacious. 1. Do resolve to give up something you really like. It could be chocolate, a favorite television program (good thing Downtown Abbey falls on a Sunday and the season is almost up), Facebook, etc. 2. Plan on making visits to the elderly and sick in your neighborhood or parish, who are in hospitals or nursing homes, at least once a week. 3. Invite your priest over for dinner or lunch with your family. However, this suggestion is not for single women. 4. Make a Holy Hour of Adoration daily during Lent. 5. Resolve not to argue with your spouse. But, it is vital that you pray to the Holy Spirit and Blessed Mother for this one. You will need the strength to keep your mouth closed especially when your spouse is wrong or unjust. 6. Stop after dinner. No snacks after 7pm for example. 7. Stop listening to music in the car during Lent. If you must listen to something, listen to Handel's Messiah or the soundtrack of the Passion. 8. Eat dinner at the table, as a family. 9. Do an act of kindness for each member of your family during Lent. We usually tend to be kind to others but neglect our family in this respect. 10. Go to confess weekly during Lent, making sure to examine your conscience properly, of course. 11. Pray about finding the right spiritual director. 12. Stop reading secular books, magazines and even websites during Lent. Instead, read spiritual books, watch spiritual movies and EWTN. The internet is filled with beautiful sites where you can be filled spiritually. You can even get daily readings in your emailbox. Just look around. For example, Spiritual Direction http://rcspiritualdirection.com/ and right now The Catechism of the Catholic Church readings are being sent daily via email. See sidebar for more info. 15. Eat meatless during the week and not only on Fridays of Lent. 16. Don't shop for anything that is not necessary such as clothes, goods, etc. The money saved on impulse shopping can be giving as alms to the poor e.g. Ricebowl from CRS. 17. Give up movies, eating out at restaurants, theater, bowling, etc. during Lent. If you think about it, it is hard to enjoy oneself if we meditate on the Passion of Christ. 18. Volunteer at your parish, outreach center, local shelters or just bring a meal to a person in need. 19. Think twice before getting together with friends. If you know it will lead to gossip or gripe-sessions about our spouses, children or employers, maybe that time can be used for something better. Instead, get together with friends to discuss a good spiritual book you are reading or to knit a blanket for a homeless shelter. 20. This time is also perfect for decluttering our homes and simplifying our lives. Fill one bag or box at a time and donate the stuff you no longer use, want or need. 21. After praying the Divine Mercy chaplet at 3:00 p.m., spent the rest of the hour of mercy in prayer or do your spiritual reading then. It is also a perfect time to do the Stations of the Cross. 22. If you cannot give up social networking during Lent, use your time on them for evangelization. Tweet quotes from the saints, post a beautiful Catholic piece of art with scripture or a quote from a saint, as your Facebook status. You can also do this on Pinterest. 23. Refrain from making negative comments, complaining or criticizing anyone or anything on these social networks and in real life. 24. Take a walk of the beach or in the woods, even if it is cold and reflect on God's goodness. (just be careful and keep safe). 25. Whenever your family asks you for something and you automatically want to say no, say yes instead. Let their will be done during Lent. Well, these are my twenty-five suggestions for you. Please feel free to share some of yours so that we can get 40 suggestions. With much aloha Pope Benedict! At this time we have passed a half-century since the Second Vatican Council (1962-1965) and the 450th anniversary of the Council of Trent (1545-1563). These anniversaries offer an opportune occasion to recall also the importance of the other nineteen general councils of the Catholic Church. Church historians remind us that tracing the developments of the twenty-one general councils is an outstanding way to survey the two-thousand-year history of Christianity. While the general councils did not treat every aspect of theology and spirituality, they did address the major issues of their times. For this reason scholars recognize these meetings as an essential lifeline in church history. Church councils imply democratic or constitutional meetings happening in a hierarchical church presided over by a pope claiming a singular and unique authority directly from Christ. Such a paradox is quite interesting and controversial, and a dominant theme threading across all the general councils. Another prevailing theme is the cycle of challenge and response that brings councils into session to treat heresy, the need for reform, questions of church authority, and other significant issues popping up in various periods of the two millennia of Christian history. The councils are the church’s “think tanks” for solving problems and plotting the future. Often issues are churning for decades or even centuries before they are brought to a council for solution. The council fathers enunciate guiding principles and procedures, and plot their implementation. The general pattern is to identify the reason for convoking the council, setting the goal, a period of preparation, the meeting itself, and the efforts to put into practice the decisions. While still recent history, Vatican II’s landmark sessions (1962-1965) offers an opportune moment for a retrospective review of the previous twenty general councils. This will not only aid in understanding the specific history of each, but especially to put Vatican II and its results into clearer perspective. Studies of Vatican II and its different kind of conciliar documents abound. But what is lacking is sufficient attention to the prior councils and their documents in light of our own experience of Vatican II. The past is prologue. Reading about councils is one thing. Living through a council and having learned about earlier councils is quite another. Firsthand familiarity with Vatican II gives people today an exceptional insight and perspective on how other councils worked. Contemporary Christians are more fortunate in this regard than the millions who lived during periods when no councils met, such as the 306 years between Trent and Vatican I, or the 92 years between Vatican I and Vatican II. Tracing the twenty-one general councils in broad strokes, we can group them in four periods of church history because they seem to fit together in these four eras: early, medieval, reformation, and modern. In the first millennium the councils met to formulate doctrinal statements to correct heretical differences. The councils of the middle ages and reformation dealt with reforming church divergences and clarifying certain doctrines. In the modern period the two Vatican councils were gathered for dissimilar reasons: the first to define papal infallibility; the second to renew the church in line with contemporary developments. Some councils completed the unfinished business of their predecessors. The first eight councils, Nicaea (325) to Constantinople IV (869-870), met in somewhat rapid succession because they were refining creedal statements. Several followed soon after another to address persisting problems. The first four Lateran councils met successively in less than a century (1123, 1139, 1179, 1215) to address questions of church reform. In later situations councils finished the work that earlier meetings could not because of difficult circumstances. Reviewing the historical contexts and major undertakings of the councils to respond to particular challenges will help to recognize the connecting themes and to form a general synthesis of the church’s journey to the present. What constitutes a general council? This is a meeting convened by the pope, although this has not always been the case in early church history. All bishops are called to participate, but others are also invited. There is no regular schedule for convoking a council; they are called as needed so that the council fathers can address the demanding religious and social issues of their day. From the very outset of the Church’s life, Christian leaders have used such major meetings to compare notes and solve problems. While Constance failed in this attempt, no one in church leadership doubted the value and crucial importance of a general council. In 1512, five years before Martin Luther posted his 95 Theses, John Colet, the dean of St. Paul’s Cathedral in London and a friend of Erasmus, preached a sermon to a gathering of England’s clergy in which he clearly stated: “For nothing ever happens more detrimental to the church of Christ than the omission of councils, both general and provincial.” He and others knew the church needed to call a council to address critical conditions. While the council held in Jerusalem and recorded in the Acts of the Apostles is not listed with those we consider general or ecumenical, this meeting of Peter and James, Paul and Barnabas, and others is often noted as the first and model council. Constantinople II (553) explicitly mentioned the importance of the apostles coming together to consult and to make a decision. The New Testament includes two accounts of this meeting: Acts of the Apostles 15 and Galatians 2:1-10. The “Council of Jerusalem” probably met in 49 or 50 to address the question that arose a handful of years after Jesus’ death and resurrection: Must one be a Jew in order to be a Christian? The issue boiled down to whether men needed to be circumcised and whether all were bound by the Jewish dietary laws. In his letter to the Galatians, Paul relates that the group seemed to agree over a handshake, as though everyone participated equally in the decision: “they gave me and Barnabas their right hands in partnership” (Gal 2:9). But in the Acts of the Apostles, James listened to everyone and then made a decision: “My brothers, listen to me…. It is my judgment...” (Acts 15:13, 19). A slight discrepancy appears between Acts, which suggests one decision maker with whom others agreed, and Galatians, which sounds like a consensus decision. This situation is indicative of a tension in several general councils between popes exercising their primacy and bishops emphasizing collegiality and collaborative action. The present Code of Canon Law, promulgated in 1983, explains the working relationship between pope and bishops at general councils (canons 336-341). Vatican II’s Lumen Gentium (no. 22) uses almost the same language. Canon 336 declares that the two working together are the final authority in the church: “The college of bishops, whose head is the Supreme Pontiff, …together with its head and never without this head, is also the subject of supreme and full power over the universal church.” The pope is a member of the college of bishops as head of the diocese of Rome, but the emphasis is placed on the pope as head of the college. In regard to councils, canon 337 states: “The college of bishops exercises power over the universal church in a solemn manner in an ecumenical council.” Canon 338 reserves to the pope sole authority in some matters: convoking an ecumenical council; presiding over it personally or through others; transferring, suspending, or dissolving a council; approving its decrees; setting the agenda, and approving items added to the agenda. Current church law states that an ecumenical council cannot come into play without papal authority. But history shows exceptions in the first millennium when emperors and one empress called and sometimes presided over councils, usually with the knowledge and blessing of the popes. Nor did popes always attend general councils in person. In such a case they would send a legate to speak for them. The decrees of a general council are valid and binding only after the pope approves them and orders them published. Canon 341: “The decrees of an ecumenical council do not have obligatory force unless they have been approved by the Roman Pontiff with the council fathers, confirmed by him, and promulgated at his order.” Only at the behest of the pope are the results then shared with the universal church. Bishops are the main participants, and canon law gives them alone the deliberative vote, one that is binding on a council’s decisions and not merely an opinion that may be overlooked. However the convening pope may invite others to a council and determine how they will participate. This is covered in canon 339. At Vatican II, John XXIII and Paul VI gave a deliberative vote to the heads of religious orders, and invited the advice of many experts and observers – clerical and lay, male and female, Catholic and non-Catholic – especially in committee sessions, public lectures, and private consultations. The terms “universal,” “ecumenical, and “general” are ordinarily used interchangeably, and somewhat loosely. But it is important to be accurate and note the distinctions. “Ecumenical” comes from the Greek word for “universal.” A truly ecumenical council, then, is a gathering that included representatives of the church from all parts of the world. By that definition, the first seven major councils were ecumenical, as Chalcedon called itself in 451, because they included bishops from the eastern and western parts of the Roman Empire, considered to be the entire world at that time. In fact, very few western bishops were present at some of those meetings. While the separated Eastern Orthodox churches consider only the first seven councils ecumenical, the Roman Catholic Church recognizes twenty-one to be ecumenical or general, even though the east was missing from the councils of the second millennium. Lateran I (1123) called itself a general and not an ecumenical council because no eastern bishops participated. Basel-Ferrara-Florence-Rome referred to itself as ecumenical since eastern and western bishops gathered to discuss reuniting the church. The common usage of “general council” acknowledges the absence of the east from most meetings after the first millennium. This use became the custom in the course of time. In 1974 when marking the 700th anniversary of Lyons II, Paul VI said it was “counted sixth among the general synods celebrated in the western world,” since those meetings of the medieval period took place in western Europe. Paul VI used “synod” instead of “council” but both terms carry the same meaning in the church records of the day. The important distinction is the difference between general, universal, or ecumenical meetings, and local, regional, or provincial meetings. Numerous provincial or local councils or synods met during the first three centuries of Christianity, especially during the third century, to handle matters of doctrine and discipline. These earliest church meetings in North Africa, Rome, Gaul, Asia Minor, and Iberia paved the way to Nicaea I, the first general council. Many local meetings, some attended by popes or their delegates, also met during the Middle Ages. Today regional synods of bishops continue to meet, sometimes in Rome, and frequently in the home countries as national synods or conferences. The time between councils, their duration, and their attendance reveal a wide variance. Counting twenty-one general councils may lead one to think that they were called about one each century. But in reality general councils have met infrequently and often in clusters. And there were long periods of time that experienced no councils at all. Three centuries elapsed before Christianity was recognized by the Roman Empire. Only then was the first general council convened. Then eight councils sat in the 545 years between Nicaea I (325) and Constantinople IV (869-870). Two and a half centuries later the seven medieval councils, Lateran I (1123) to Vienne (1311-1312), met over the next 189 years. With the passing of another century two more general councils met within three decades: Constance (1414-1418) to Basel-Ferrara-Florence-Rome (1431-1445). In the sixteenth century Lateran V (1512-1517) followed more than sixty years later, succeeded by Trent, which met in three stages over 1545-1563. Three centuries transpired before the next council, Vatican I (1869-1870). Another century and Vatican II (1962-1965) met. General councils varied in duration. Lateran II sat only a week, while Constance (1414-1418) met for three and a half years of steady activity. But length of time is no indicator of importance or achievement, for Lateran IV gathered for only twenty days and was the most impressive of the medieval councils. Vatican II met 281 days over four autumn gatherings, but, as at most councils, a great deal of work took place before and after the four sessions. Lateran V met for five years, 1512-1517, but accomplished little. Concerning participation, as few as a dozen members were present during a low point at Constantinople IV (869-870), and only seventeen during one session of Trent in 1551-1552. In striking contrast 2,540 packed St. Peter’s Basilica for the first session of Vatican II in 1962. But the historical period of a general council was not necessarily a big influence on attendance. In spite of difficulties in travel and communication during the ancient and medieval eras, about 600 took part in Chalcedon (451), more than 400 at Lateran IV (1215), and nearly 900 at Constance (1414-1418). Even though each general council exhibited distinctive characteristics, a common thread runs through all. Each council rose to the occasion and responded to the urgent needs of its day. Hopefully this brief and broad view of conciliar history offers a context for a better appreciation of our church’s growth and development, and places the church’s life in clearer perspective. Perhaps it will whet our appetites for delving a little deeper into how these councils have served the church in addressing the challenges they confronted. History repeats itself. Each council must be seen in its proper context. Our faith reminds us that the Holy Spirit has guided the Church and the fathers of the councils through all the centuries. And the Holy Spirit will be with the Church in all the years to come. If we lose sight of this fundamental truth, we risk the confused thinking that the Holy Spirit might abandon Christ’s Church. But we know the Holy Spirit, like Christ himself, is always with us. At the outset of Vatican II, Blessed John XXIII noted that “It is now only dawn….” We are still digesting the work of Vatican II: 16 major decrees approved by more than 2,500 council fathers, who cast over 1,200,000 ballots after 1,000-plus speeches, and over 6,000 written interventions. Consider this an invitation and opportunity to refresh and to renew ourselves by rereading (or reading for the first time) the dynamic teachings of Vatican II and of earlier councils. These documents reveal a Church ever faithful, a divine gift, a Church ever dynamic, and a grace that continues from the time of the Apostles. This morning our Holy Father, Pope Benedict XVI, announced his intention to resign the papacy on February 28, 2013 at 8:00 p.m. (Rome time, 9:00 a.m. Hawaii time). Retiring from the papacy is so rare in the history of our Church that such resignations can literally be counted on one hand. It is for the love of the Church, however, that our Holy Father has discerned that this is what God is calling him to do, since he no longer has the physical stamina necessary for such a demanding office. 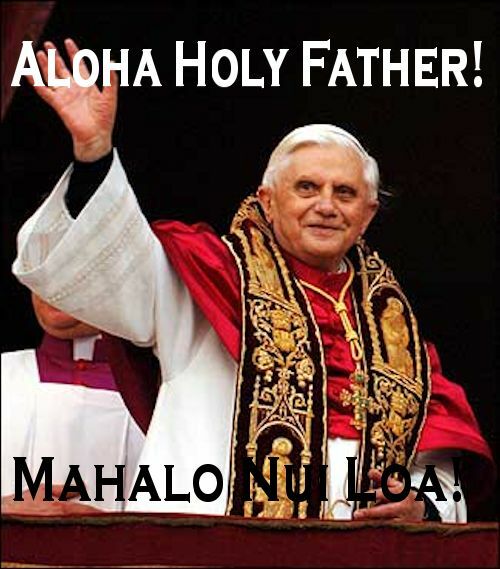 Pope Benedict XVI has left a clear mark on the Church in Hawaii in the almost eight years of his papacy. He was elected to be the Bishop of Rome and the Successor of St. Peter on April 19, 2005 at the age of 78. On May 5, 2005, I was informed that he had chosen me to be the Bishop of Honolulu, even though the announcement was not made public until May 17. I was one of the first bishops in the world to be named by Pope Benedict XVI. On May 14, 2005, under his authority, Mother Marianne Cope was declared Blessed at St. Peter’s Basilica in Rome. On October 11, 2009, our Holy Father declared Father Damien DeVeuster, SS.CC. a Saint; and on October 21, 2012, he canonized St. Marianne Cope, O.S.F. We will always be grateful for the ministry of Pope Benedict XVI. Our gratitude goes far beyond what he has done for Hawaii. He has been an inspiring teacher of the faith with profound insights in his homilies, speeches, encyclicals, and exhortations. 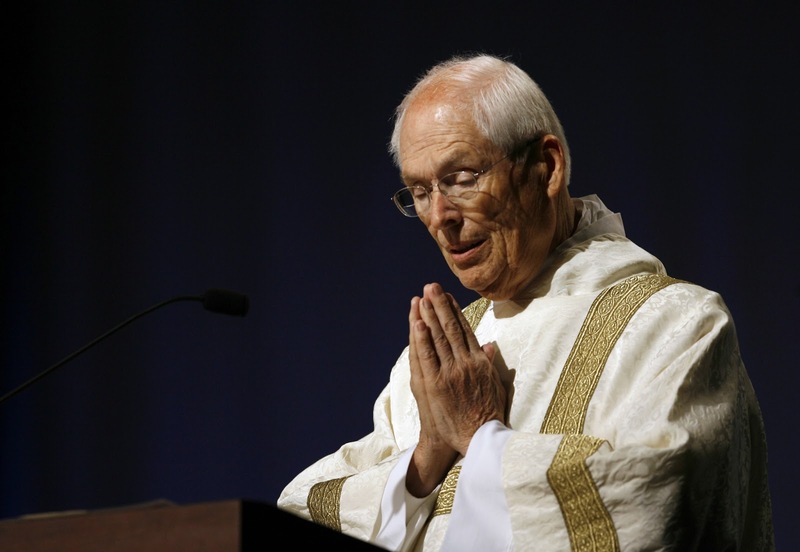 He leaves a great legacy to the Church and the world, and his teachings will be worth studying and pondering for generations and centuries to come. He has been a prophet of love, never backing down from the demands of the gospel, the good news that truly sets all human beings free, but always in a spirit of love. He has suffered much criticism, but he has never lost sight of the profound love of Jesus Christ or of Christ’s desire to touch every person and nation on the face of the earth. I am personally grateful for the opportunities I have had to meet Pope Benedict XVI for brief exchanges. I first met him in September, 2005 at an audience he held for newly ordained bishops throughout the world. I met him again at the canonizations of St. Damien and St. Marianne. Last April the bishops of our Region had a more extensive meeting with him during our “Ad limina” visit to Rome to report on the state of our dioceses. We offer our prayers of thanksgiving for this Servant of the Servants of God and our prayers for good health and much joy in his retirement. We also pray fervently for the Cardinals who will gather in consistory in the month of March to discern together the one the Lord chooses, through their election, to be the new Pope. And we pray for our new Pope even now, whoever he may be, that he will continue to give courageous and loving witness to Jesus. Bishop Larry Silva invites all to a special Mass on Wednesday, February 27, at 7:30 p.m. at the Cathedral of Our Lady of Peace, Honolulu, in which we will give thanks to God for the Petrine ministry of Pope Benedict XVI, who will leave office the following day. We will also pray for the guidance of the Holy Spirit on the Cardinals who will elect his successor. 1. God is always in charge. He is not leave us orphans. 2. Pope Benedict did not make this decision lightly. There was a lot of prayer on his part, hence the Holy Spirit is and was with Him through it all. 3. It was a profound act of humility on our Holy Father's part to do this. 4. 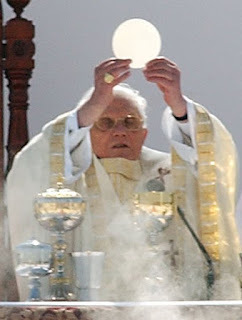 It will do no good to make speculations as to the "real reasons" behind Pope Benedict's resignation. It is our responsibility to continue to pray for him and for his successor. 5. The evil one will take this opportunity to perpetuate lies about our holy father, it is our responsibility to speak out with the truth whenever it is necessary. 6. The gates of hell will not prevail. Mahalo nui loa Holy Father for your love of church, for your leadership as our shepherd and for your example of deep humility.